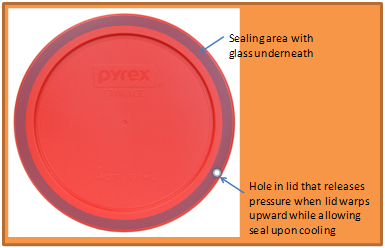 Consider a typical refrigerator container storage lid. Reinforce the polymer of the lid so it does not sag when cooled after heating. Include a self-sealing pressure release hole so it does not pop off when heated. store for weeks in the refrigerator, and a wide range of optionss to substantially reduce wasted food...keeping food fresher, longer. See US Patent Application No.15/043690.